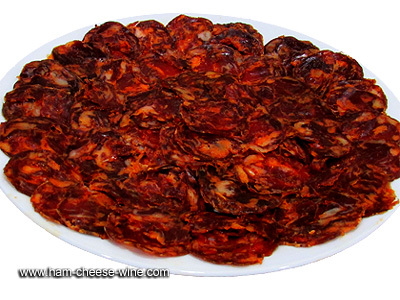 Iberico de Bellota Sausage Dehesa Cordobesa is a culinary gem typical of the western regions of the Iberian Peninsula. Sausages of the region of Cordoba provide consumers the chance to purchase and enjoy a quality product, organic and natural created under unique conditions. Covap (Cooperativa Andaluza Ganadera del Valle de Los Pedroches) started in 1959 when a group of men and women decide to seek raw materials to feed their animals. This project would change the lives of the inhabitants of Valle de Los Pedroches, Valle de La Serena and Valle de Alcudia. Over the years, and true to that founding spirit, the present COVAP has come to be, with a powerful dairy, meat and animal feed industry. 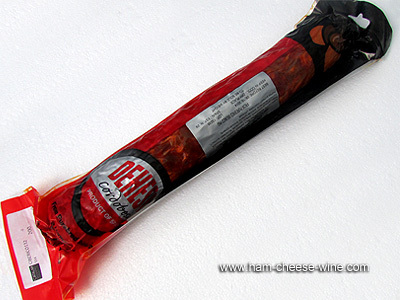 Iberico de Bellota Sausage Dehesa Cordobesa is a product that is made from a selection of meats from Iberian acorn pork, stuffed into natural casings. 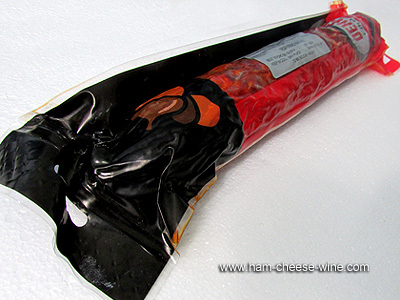 The combination of ingredients and a slow process of curing and aging, make this a high quality product, excellent taste and delightful aroma. 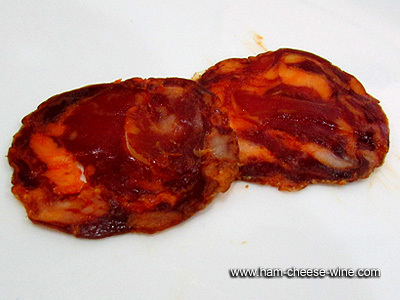 It is a raw-cured sausage that has very particular characteristics, based on chopped and minced meat from Iberian pigs fed primarily acorns, which is added paprika and high quality spices. Iberico de Bellota Sausage Dehesa Cordobesa is one of the most emblematic products of the traditional slaughter with a high nutritional value, as it is made from the finest Iberian pork meat, seasoned with paprika and other spices, which gives it a delicate characteristic flavor and aroma. Iberico de Bellota Sausage Dehesa Cordobesa is cured in artificial dryers for at least 60 days to reach a perfect balance of its ingredients. The unique aroma of Iberico de Bellota Sausage Dehesa Cordobesa (Covap) is derived from a selection process based on the passion of the cooperative professionals and factors related to altitude, climate, humidity and temperature, all of which combines with the existence of a characteristic and native bacterial and biological flora of Los Pedroches area. Store Iberico de Bellota Sausage Dehesa Cordobesa (Covap) at room temperature. If you like to have Iberian sausage in the pantry, you must consider certain precautions. 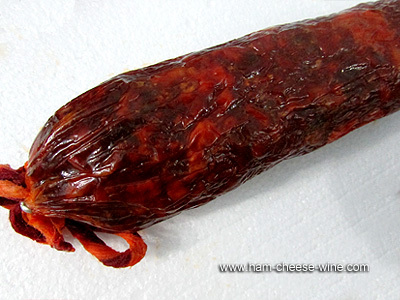 First, do not remove the skin of the whole piece of sausage, only what you will eat, this seems obvious, but sometimes it happens due to ignorance. Store in a dark, cool, dry place, a cupboard or pantry is ideal. If exposed to light for long periods, all sausages undergo transformations in both its color and flavor. Cover the cut with a plastic film and wrap with a cotton cloth. And especially do not hang off the kitchen, but keep it in a horizontal position in the pantry, since temperature changes will eventually deteriorate the taste, texture and even melt the fat if it is an Iberian acorn sausage. 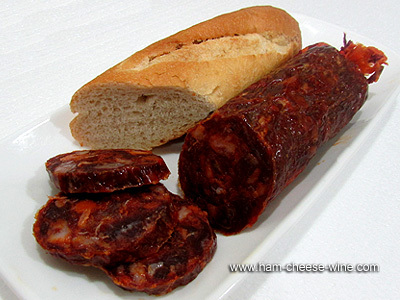 Iberico de Bellota Sausage Dehesa Cordobesa (Covap) is always ready to cut and serve, does not need refrigeration. 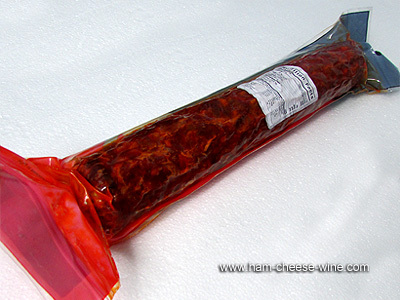 It comes in natural casings, with its characteristic red color differing meat from fat, with a firm and compact consistency. 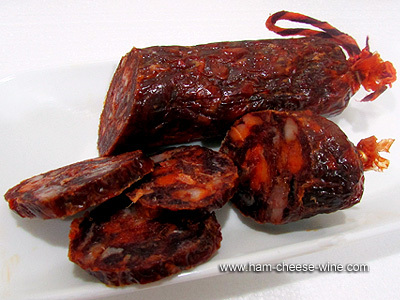 This Iberico de Bellota Sausage Dehesa Cordobesa that Covap offers has a soft but intense flavor characteristic of this product that makes it a delicacy in sight and smell and a gift to the palate. Iberico de Bellota Sausage Dehesa Cordobesa is made out of lean and fat from Iberian pigs, fed on grass and acorns in a long, open range fattening which allows for their fat to be high in polyunsaturated fatty acids, particularly suitable for the prevention of coronary and circulatory problems. Once a homogeneous mass is obtained, it is inlayed in the gut and taken to the cellars for the curing process to complete. This is done in refrigerated cellars, automatically controlled by a regulating equipment that keeps track of humidity, temperature and other parameters required for the curing to be carried out normally.